Tofino, nestled on the western shores of British Columbia's largest and most populous island, is an ecological gem. Here you will find the Clayoquot Sound, a UNESCO Biosphere Reserve. Photo by Ray Maxwell for Go Northwest, LLC. Located at the northwestern end of Highway 4, on the edge of Clayoquot Sound, it is best known for its whale-watching opportunities. Humpback, Grey and Killer whales use the nearby waters as a migration route during their 10,000-mile/16,000 km round-trip passage from Baja California to Alaska. More than 20,000 whales make this sojourn each year, and can often be seen from shore during their spring migration. The Pacific Rim Whale Festival, which takes place in mid March, celebrates the annual migration of the Pacific Grey whale. One of the largest environmental festivals on the island, it features music, educational presentations, interpretive walks, food and of course, whale watching opportunities. 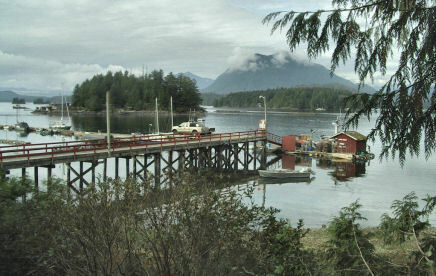 The festival takes place in and around Tofino and its southern neighbor, Ucluelet. Tofino is also known for its distinctive First Nations art. Native-run galleries feature art from around the region, ranging from totems to hand-carved masks and jewelry. The nearby Pacific Rim National Park Reserve, which was established in 1970, has also helped to put this small fishing village on the map. The park attracts as many as 1 million visitors a year and is known for a wealth of recreational and ecological attractions. Wildlife viewing, back country hiking and camping are a few of the park's most popular activities. Tofino lies west of the cities of Port Alberni and Qualicum Beach and is reachable by car from Victoria via highways 1, 19 and 4. Tofino can also be reached by air from Vancouver, Victoria and Nanaimo. Name: Named after Tofino Inlet, itself named in 1792 for Spanish hydrographer Vincente Tofino de San Miguel. Location: West side of the island, 42km (26 miles) north of Ucluelet, on Highway 4, 130 km (81 miles) west of Port Albernl, 337 km (209 miles) northwest of Victoria.